"Rousing." "Thrilling." "Addictively bold." Just a few of the superlatives the critics are using to describe the latest film in the Star Wars saga. The Last Jedi, writes the Telegraph, is "enormous fun" and "will leave fans beaming with surprise". The Guardian calls it "an explosive sugar rush of spectacle" possessing "a tidal wave of energy and emotion". Variety, though, swims against the tide, describing it as "the longest and least essential chapter in the series". Rian Johnson's film, says Peter Debruge, is "ultimately a disappointment" that "gives in to the same winking self-parody that is poisoning other franchises of late." Writing in The Verge, Tasha Robinson tends to agree: "Audiences will likely come away from The Last Jedi with a lot of complaints and questions." Released in the UK on Thursday, The Last Jedi sees Mark Hamill and the late Carrie Fisher reprise their roles as Luke Skywalker and Princess Leia. 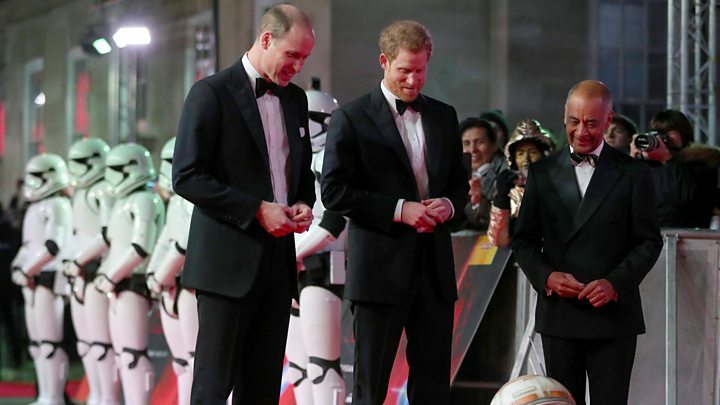 British actors Daisy Ridley and John Boyega also return from Star Wars: The Force Awakens, as do Adam Driver, Oscar Isaac and trundling robot BB-8. Driver's Kylo Ren is singled out for praise by USA Today, who describe the character as "blockbuster cinema's most magnetic and unpredictable antagonist since Heath Ledger's Dark Knight Joker." Laura Dern, Benicio Del Toro and relative newcomer Kelly Marie Tran are among the new cast additions. The Guardian's Peter Bradshaw calls her "terrifically good", while Digital Spy predicts she will "tear up Tumblr like nobody's business". Picking up where 2015's The Force Awakens left off, The Last Jedi sees Rey (Ridley) try to persuade Luke, now a reclusive hermit, to rejoin the Resistance. Writing for the Radio Times, Alan Jones says "it's great to see [him] back in the Skywalker saddle, albeit now riddled with self-doubt and a broken spirit." In space, meanwhile, what's left of the Rebellion prepare for a last stand against the all-powerful First Order and their supreme leader Snoke. The result, writes Total Film's Jamie Graham, is "an excellent middle chapter bursting with wit, wisdom, emotion, shocks, old-fashioned derring-do, state-of-the-art tech, and stonking set-pieces." Spectacular effects, light saber duels, outlandish creatures and surprise revelations help fill the film's 152-minute running time. Some critics, though, feel it would have benefited from some trimming. "The Last Jedi is a long work of art that doesn't know when to quit," writes Forbes' Scott Mendelsohn. Critics have been asked to avoid plot spoilers in their coverage of the film, which is expected to be an immediate box office smash. The Last Jedi gives you an explosive sugar rush of spectacle. It's a film that buzzes with belief in itself and its own mythic universe - a euphoric certainty that I think no other movie franchise has. And there is no provisional hesitation or energy dip of the sort that might have been expected between episodes seven and nine. What there is, admittedly, is an anticlimactic narrative muddle in the military story, but this is not much of a flaw considering the tidal wave of energy and emotion that crashes out of the screen in the final five minutes. It's impossible not to be swept away. Rian Johnson's film certainly feels like Star Wars: it even has a supporting cast made up of British character actors and gorgeously CG-augmented rubber creatures, including porgs, a kind of hyper-marketable cross between a puffin and a young Justin Bieber. But it's not a Star Wars you're entirely sure Lucas would or could have ever made himself. 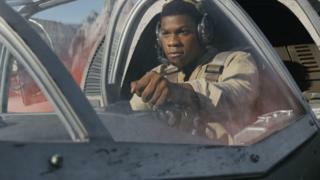 Rather than playing the hits, as JJ Abrams's franchise-reviving The Force Awakens did two Christmases ago, it flexes its fingers before riffing over old chord progressions in ways that will leave fans beaming with surprise. The Last Jedi possesses the same reverence for the galaxy Lucas created, paying homage in all the right places (from the chills we get from John Williams' iconic fanfare to the new-and-improved walkers that appear during the climactic siege) while barely advancing the narrative. Ultimately, there's only so much wiggle room Johnson has to play with a property that seems destined to generate a new instalment/spin-off every year until we die - which means that however many Death Stars or Sith Lords the Resistance manages to defeat, there will always be more, and no matter how few Jedi remain, there can never be none. Time and again, Johnson finds a cinematic grammar that feels new to Star Wars; big close-ups (tender touching hands), top shots, elegant camera tracks and pulling out in-world sound, leaving just music and image. And Johnson isn't afraid to go trippy, either - a scene in which a character repeatedly clicks their fingers could have come from a '60s arthouse flick. When the bits of serious fan service do come, they feel earned rather than rammed down your throat. The film doesn't wallow in nostalgia - it acknowledges the past while moving Star Wars into new, uncharted territory. At two-and-a-half hours, the film is lengthy, but events move at such a pace that it doesn't drag or threaten to outstay its welcome. Johnson has created a movie that is both quintessentially Star Wars and richer than anything that has come before. Running more than two-and-a-half hours, the eighth Star Wars movie built around the Skywalker clan is the longest under that banner and showcases an abundance of action. But despite the enormous scope and visual spectacle, too many key components of the film - including those that have kept die-hard fans guessing and debating - prove unsatisfying. In crass commercial terms, no clairvoyance is necessary to predict that The Last Jedi will be a huge hit, blunting any criticism. Yet if The Empire Strikes Back stands as the defining chapter in the Star Wars saga, as second movies go, Last Jedi ranks closer to the Attack of the Clones end of the gene pool.